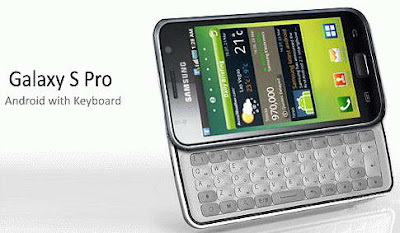 Samsung on its way to introduce a new smartphone that belongs to its Galaxy family, named Samsung Galaxy S Pro.Samsung Galaxy S Pro Smartphone is reported to come in side slide form factor featuring a QWERTY keyboard.The Smartphone runs on Google Android 2.1 OS with TouchWIZ 3.0 UI. The upcoming Samsung Galaxy S Pro Smartphone equips a 4-inch Super AMOLED touchscreen display with a resolution of 480×800 pixels and is powered with a 1GHz Samsung/Intrinsity ARM Cortex A8 CPU .The smatphone also houses a high quality 5-megapixel camera with HD video recording (1280×720 pixels).Another exiting feature of Galaxy S Pro handset is the Bluetooth 3.0 interface. Samsung Galaxy S Pro Smartphone features WiMAX, 512 MB RAM, 8.2GB flash storage, Wi-Fi, supports CDMA EV-DO Rev. A standard, 0.3MP camera for video call.The new smartphone from samsung will be available for sales only by the second half of 2010. Tags:-Android, Galaxy S Pro, gets detail, Samsung Galaxy S Pro Smartphone Features, Samsung Galaxy S Pro Smartphone specifications, Samsung Galaxy S Pro Smartphone details, Samsung Galaxy S Pro Smartphone availability, Samsung Galaxy S Pro Phone, Bluetooth 3.0 Smartphone, Samsung, Samsung Galaxy S Pro, Sprint, Upcoming, WiMax phone.